Well, it's the home stretch before Christmas and I think today's installment of "Stinger Shots" is appropriate for the occasion. We're taking a look at the reissued King Grayskull from the Masters of the Universe Classics line and he's sporting a barbarian Santa Claus motif just in time for Christmas! 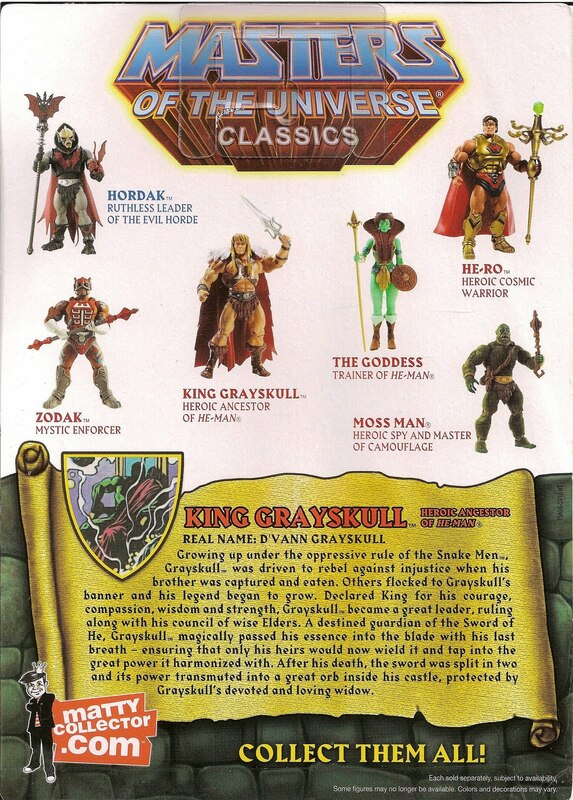 King Grayskull was originally the first release in MotUC, way back in 2008. At the time I had no idea who he was, nor had I ever heard of him (I wasn't familiar with the 200X series, either). However, as I became interested in the line and started collecting the figures sparingly, I knew KG was one I wanted. In early 2010, I was happy to learn he would see re-release later in the year, but when he was shown off at SDCC with his new colors, I had mixed feelings. As time went on and more pictures surfaced, he started to grow on me. The more I looked at the redeco, the more it looked like what a gritty barbarian warrior SHOULD look like. Though I was initially turned off by the silver finish of his harness, I'm glad to say that it looks great in person and isn't as flashy as I thought it would be. I'll admit I still think the colors on the cape are an odd choice. He's blatantly sporting Santa Claus colors! The shoulder portion of the cape is even flocked to recreate fur, but it does make for a cool look. The cape helps him standout on the shelf, but I'll have to wait and see how I feel about it during Summer when Santa and Christmas are out of my mind. King Grayskull features a few accessories, some pretty cool, some very "meh." First up is his power sword featuring a very cool phasing effect, giving the illusion of the sword overflowing with mystical energies. KG also comes with the standard He-Man shield featuring the same color scheme. The "meh" accessories start with the half swords. Grayskull has two half swords in the same colors as He-Man's standard sword. I'm not a fan of the half swords, not even sure what the point of them is, and I don't really care to have them. Give me some more FULL weapons! Grayskull should have an axe, but not the same old He-Man axe, but a badass one like the one Vikor's packing. The other mediocre accessory is the debuting "Orb of Power." It's basically just a blue marble matching the sparkly blue plastic Grayskull's full sword is cast in. The sad thing about the Orb is that there isn't anything to display it on. The King himself can't really carry the sphere, you have to just balance it on his arm. 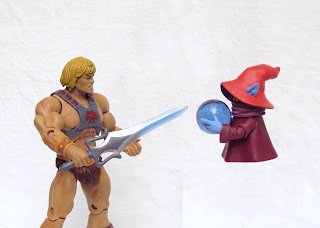 I don't have a Goddess figure, so Orko is my go-to sorcerer. If you're a slave to MotU-thology, deal with it. Mattel seems to just throw a bunch of random ideas into their bio write-ups, so I figured I could create my own stories, too! I can safely tell you that I now love the color scheme on Grayskull! The dark brown used on his loincloth, boots and harness give him a more realistic feel as opposed to the cartoonish colors on He-Man. A sweet combination is He-Man's head on Grayskull's body. Once again, the colors just seem much more realistic and end up creating a cool version of He-Man. Conversely, KG's head on HM's body creates a bit of a weird combo. I'm pretty sure I'll never display him like this. Here's another barbarian king to compare to. This is a WWE Elite Triple H borrowing the "Entrance Greats" Triple H attire (minus the knee pads) and featuring "Elite" Batista's boots, which I jazzed up a bit by painting the studs silver. I call him: Hun-Tur. King Grayskull doesn't look too bad sporting Triple H's cape, huh? All in all, I'm very happy with King Grayskull. I think he's an awesome figure and any MotUC collector (die-hard, casual or otherwise) would enjoy him the same. I'd say I'm a casual collector when it comes to He-Man's universe, but it's figures like these that cause me venture away from the characters I remember from my childhood. He gives me high hopes for the upcoming Vikor. I'd also like to take this opportunity to thank my girlfriend for helping me acquire the King last month. If it wasn't for her generosity, I would have missed out on what ended up being one of my favorite MotUC figures to date.